The basic infantry unit is the company with the tactical unit being the battalion/brigade. I have not gone deep into the rules yet, but basing is pretty generic with a stand being a company (number of figures less important), with 2-8 companies making up a battalion. Each company holds a number of attributes that determine their fighting ability and resilience. Additionally they have an intrinsic Command (is flexible in the sense that an officer [has his own command value] attached can modify it's morale) rating and a Tactical ability (number of actions it can carry out). I have made this sound pretty confused but it is quite simple and what I can say is the advantage is that it allows one to play the game with a variable number of companies. An example is that you have to have a minimum of 3 companies (stands) to field a British battalion but can add up to 5 extra companies (stands) for the British. For the French, one can field anywhere from 2 to 6 companies in each battalion. A range is provided for base size and 6 infantry figures are recommended for a stand, but the game will work with 4, I believe. What I like about this as a painter who likes to build up armies , is that I can play the games with as little as 2-3 stands in some battalions and up to 6-8 stands in others. The process in the rulebook is points driven, but the ruleset does allow historical OB's, so one can field either a points or a historically derived force. Cavalry and Artillery units follow similar logic. The mechanisms for movement, shooting, fighting etc are all quite simple and well illustrated. I am no expert here and I have not really explored this aspect of the book but I suspect the learning curve is not steep. Forces covered with army lists etc include both the Peninsular and Waterloo Campaigns (sorry Iannick, but I am sure the European theatre will be covered knowing the reach of Games Workshop). The nationalities covered though for these campaigns are quite exhaustive though, and includes rarities like Italians, Neapolitans, Nassau, Berg, Westphalians, Swiss, Prussians, Vistula Legion, Mamluks for the French and Spanish Guerillas, Tiradores de Doyle, Don Sanchez's Cavalry, Hanoverians and all the other German states both line and landwehr for the Allies. Uniform guides for basic British, French and Prussians infantry are all provided. It is all there! Additional Rules cover sieges (that is something I have not seen before in mainstream rulesets), one can engage in escalade as well as breeching walls before sending in the Forlorn Hope. A short 12 page history section is also included. There is a nice section on Napoleonic Wargaming in general with guides to collecting and preparing figures. A nice quick painting guide to British redcoats and rifles, as well as French in campaign and dress is also provided. There are multiple points driven scenarios provided as well as a 12 battle historical campaign scenario covering the Waterloo period. This includes OB's for each battle as well as recommended terrain and scenario set up with victory conditions. A recommendation for alternative points based forces are also provided if one does not have the necessary historical forces. One can see that an enormous amount of work has gone into this. Campaign affects are outlined for success or lack there of for each battle. For someone like myself who has had a vague notion of playing out the Waterloo Campaign over the next 4 years leading up to the bicentenial June 2015, this looks like enormous fun. Throughout the book are beautiful photos of terrain and figures as well as many paintings depicting battle scenes. So to recap, this is a beautiful book and at half price is a steal. I can recommend buying it without reservation. 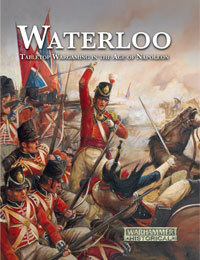 I am sure some of you will find some problems with the rules (a very personal matter), but the book itself is a valuable resource which is quite exhaustive on all aspects of Waterloo. This is the first product I have seen from Games Workshop, aside from their paints and my son's old and abandoned collection of Lord of the Rings figures, and I am really quite impressed. I have Black Powder, Lasalle, Republic to Empire and Rank and File in my collection and really this book really stands out from what I believe is a very good collection. I am puzzled by one thing though, many of the photos in the book clearly are of the Perry Brothers games, and aside from the Prussians almost all of the figures are from their line. A lot of the art is from the covers of their boxed plastic figures. They also clearly had much to do with the Black Powder ruleset. What gives? As for your final question, first off the Perrys also work for GW, but still the whole situation leaves question in my mind too. A buddy of mine asked a similar question to Paul Sawyer of Warlord Games, and he described the historical side of things is a much more communal affair as far as using certain rulesets and miniature lines. Thanks for this great review. I'm also tempted to buy the book espacially if it's at half price. A small question though: How cacualties are dealt with ? Do you remove a figure when wounded or do you place a marker next to the company ? Thanks Guys, I am working my way through the book now, still very impressed. You mark casualties, Grognard. Up to six markers, and you also sometimes need to mark up to a further five for the unit's command stand. This to me is a slight put-off for the rules, as I don't want to use up to 11 markers for just one unit. I could of course use another method (eg marking off casualties on a whiteboard on the wall etc) ... but overall having to mark so many casualties per unit does seem rather unweildy. PS: I still love the book, though!!!! Thanks for the review of WW. The Perrys are nothing if not prolific and have been involved in making figures for both Foundry and GW, hence the involvement with Warhammer Waterloo. I take Roly's point about casualty markers but there are a number of ways of dealing with it. You can just use a D6 or some of the dead'uns on a base with say 2, 3, 4 & 5 on each corner. One side or corner in touch with the base unit denotes one casualty or one of the corners for more - much more esthetically pleasing than dice etc! Enjoyed the review. Thanks for taking the time to do it. Do you by chance have the pdf files from their site?